Last Thursday, I went down to Union Square in downtown New York City and ran into Verizon’s marketing juggernaut for its new Droid phone. The new Motorola device, which was released today to the general public, is being supported by the single largest marketing campaign that Verizon has ever launched for a single device. So what does all that money buy? Well, lots of glitzy TV commercials but also some cheesy live marketing events. 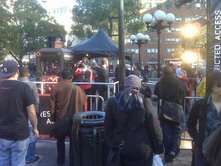 As I got off the train at Union Square, I noticed a long line of about 75 people. The people were waiting to get the chance to play a game in which you could scoop up a Droid phone in one of those boardwalk games with the little hand-operated cranes. All that was missing was a carnival barker shouting into a megaphone with a monkey perched on his shoulder. Verizon is clearly pulling out all the stops to turn the Droid into a hit. And so far, it seems to be working. Video: New Gear from Apple and Verizon Wireless? I normally would not send out a link to about a story published earlier this week. But since the scoop, New Gear from Apple and Verizon Wireless, continues to draw interest (it popped up again on the most read stories list of BusinessWeek this weekend), I am posting a link to the video commentary I taped for the story. Click here to see my video commentary on the talks between Verizon Wireless and Apple over potentially distributing to new Apple Devices. That story attracted a lot of attention but I think the reporter, whom I respect, got the story wrong. Verizon Wireless is warming to the idea of an Apple partnership. Verizon Wireless is in talks with Apple to distribute two new iPhone-like devices, BusinessWeek has learned. Apple has created prototypes of the devices, and discussions reaching back a half-year have involved Apple CEO Steve Jobs, according to two people familiar with the matter.